Sometimes there comes a time in one’s life when they decide they want to remove the jewelry from a piercing and there a number of reasons for doing so. Whether it’s to make room for another piercing or because of a job or new chapter in life, we have made a guide to help you better understand the process of removing jewelry from a piercing and letting it heal. The human body can be thought of as a force of nature that we cannot fully control, only attempt to tame. When we choose to pierce or modify our body in any way, there will be consequences at the cellular level, or even molecular level, that we cannot fully understand. It’s difficult to predict how a particular person’s body will react to a piercing since there are so many factors and since everyone heals so differently. We can only make an educated guess based on the experiences of others. There are a few factors that will determine how well a piercing hole will close or if it will close at all. Some piercings naturally heal better than others. Lip, Tongue, Labret, and other oral piercings tend to heal a lot quicker than things such as cartilage or surface piercings. With any piercing, the longer you have it and keep jewelry in it, the longer it will take to close. If a piercing is fully healed, you’ve had the jewelry in place for longer than a year, and you take the jewelry out, chances are very good that the hole will shrink, but not close completely and look as if it were never there. You will likely always see a small divot where the jewelry was placed in the skin. One benefit of being able to see the divot is that, if you change your mind and want to wear jewelry again, you may be able to have the piercing tapered open, and put your jewelry back in. We strongly recommend you see a piercer to taper your piercing back open, as sometimes (as in the case of oral piercings) one side of the piercing can stay open, while the other side closes completely. 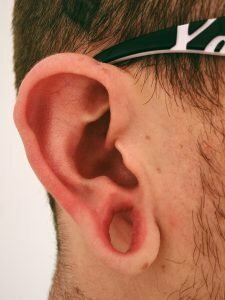 If you get pierced, and decide in the first several weeks that you simply don’t like the piercing, removing the jewelry may leave less of a scar, and the piercing may heal completely closed. If you change your mind, and want the area repierced, there is usually no problem doing so, as long as you allow several weeks for the area to completely close and heal. If you remove your jewelry, it is important you do your aftercare for several days so the area stays clean, and continues to drain for as long as possible. Whether a stretched piercing will close completely or simply shrink in size depends on many of the same variables. If the stretching process is done slowly and with care, the chance that it will heal is significantly better. Giving the skin ample time to regenerate new cells and collagen is key and one of the most important things that you can do when stretching to avoid scarring and tearing. 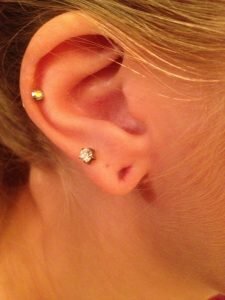 If your initial piercing was done at a larger gauge, it may not return to its original shape and size. The degree of stretch plays a role in this equation as well. 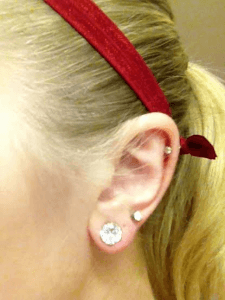 A stretch of 00g or smaller will increase the chance of the piercing closing. Proper healing of a piercing begins before the work is done. An invisible microbial war is waged in and around us every second of every day. That is why all equipment and jewelry used must be clean and sterile from the very beginning. Hygienic practices will help prevent infections that can cause abnormal healing or illness. Another important step is to heal your piercing with a vigilant aftercare routine. It’s important to use trusted professionals that care and have extensive knowledge of the process of proper piercing practices. The human body is unpredictable and forecasting how it will react in any situation is nearly impossible. The best thing you can do is to take the proper precautions, be consistent with your aftercare routine, and ask questions. At Almost Famous body piercing, we will use our knowledge, experience, and professionalism to give you what you desire with all of the safety that you deserve. Piercing with Guns vs with Needles – Which is Better?